Valentine’s Day cookies that are fool proof & perfect fun for kids! 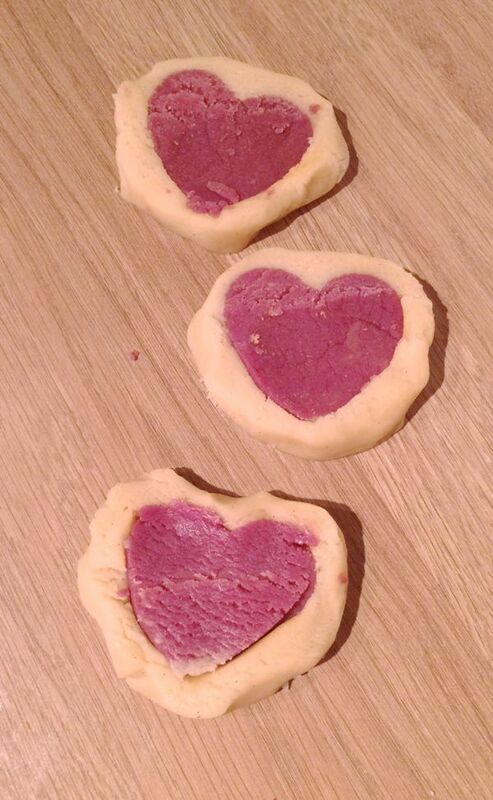 Valentine’s Day cookies for the kids to make and enjoy. So easy and perfect for tucking into over the holiday! I came across this recipe on this fab blog called Lauren’s Latest, and I think I may have become a bit of a fan girl! I’ve said before that I don’t really do much with or for the boys for Valentine’s Day other than the usual heart prints and heart-everything that we all do.  I just don’t have time, or the memory capacity to get organised and do stuff! BUT these I had to try. More for me than for the boys if I’m honest, because every year we see this kind of thing in the shops and we always buy them, always. It’s pointless, they don’t taste that good in comparison to the homemade versions and the boys (and me) always wonder how the heart got into the cookies…. my pathetic answer is usually by magic while I try to cram five down my throat before they notice that the whole one for me, one for you thing isn’t being applied to mummy. Mix the plain flour, baking powder in a bowl. Cream the butter and sugar together until white and fluffy add the egg, vanilla extract and a couple of tablespoons of the flour mixture to stop the egg splitting. Mix. 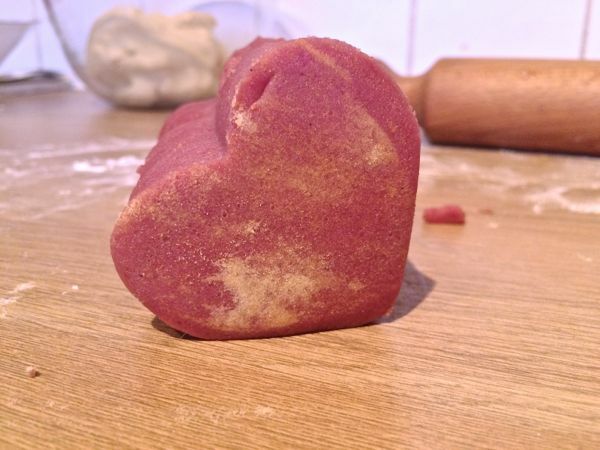 Divide off about a 1/3 of the mixture and add the red food colouring, this will be the heart part of the cookie. 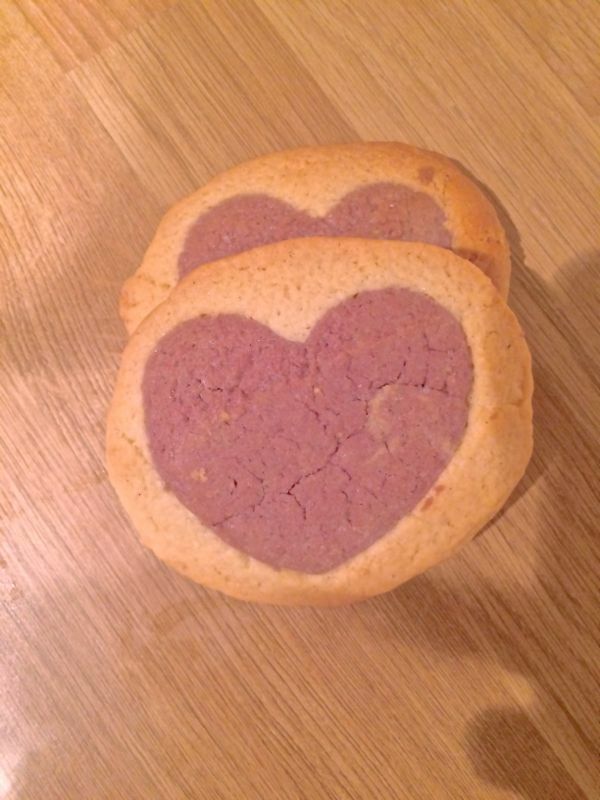 Cut out your heart shapes first from your coloured dough. 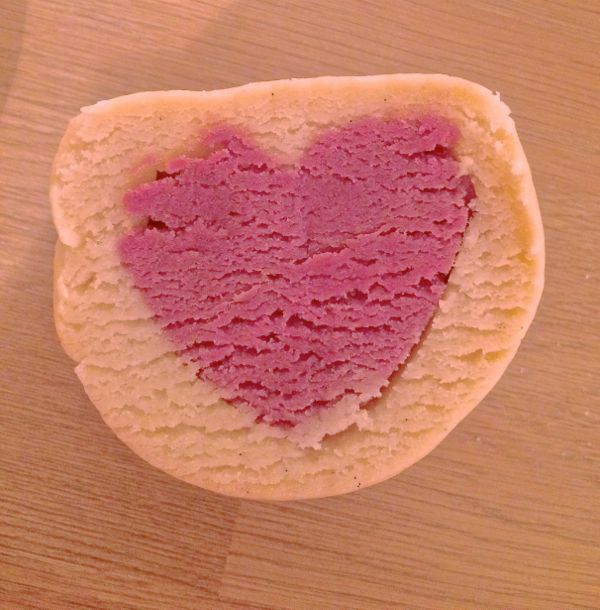 Once you have cut out your heart shapes from your coloured dough, line up the hearts to make a heart roll. Roll out the red until it is about an inch thick, cut out as many heart shapes as you can and stack them together in a line. Cover them with the remaining dough (see the picture) and wrap them in cling film, rolling if you need to to even out the ‘cookie tube’ if you like. You really must put them in the fridge for at least a couple of hours, or over night if you can (I only did 2 hours and they were fine, but if I had more time – I meant patience – I would have left them overnight). 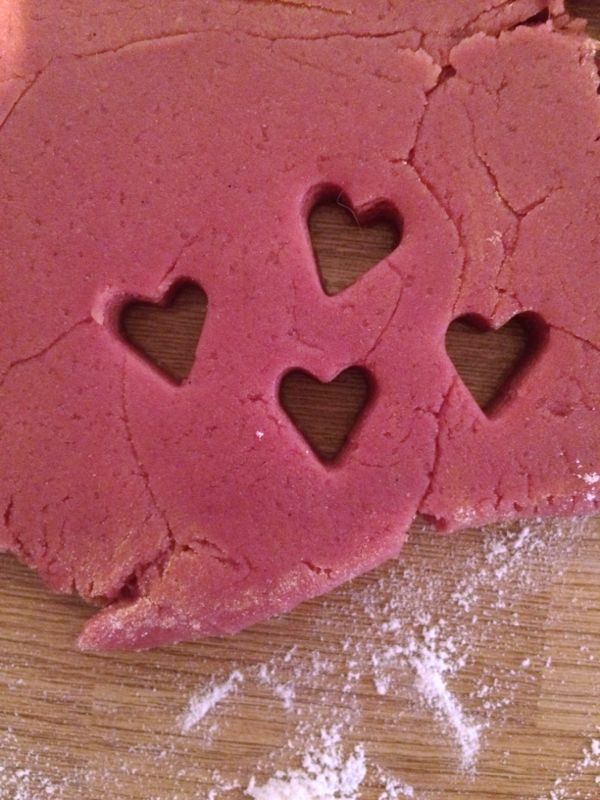 Once the plain cookie dough has been ‘wrapped’ around the red heart, place in the fridge for a time and then slice to make your cookie discs. Pre heat your oven to 350F or GM 4. Slice the mixture into 1/2 inch rounds and line up on a baking tray – you need to leave rough about an inch between each cookie because it will spread as it cooks. Bake for 8 – 10 minutes and then leave to cool on the tray for 2 -3 minutes until you can lift them off and put them on a wire rack to cool completely. 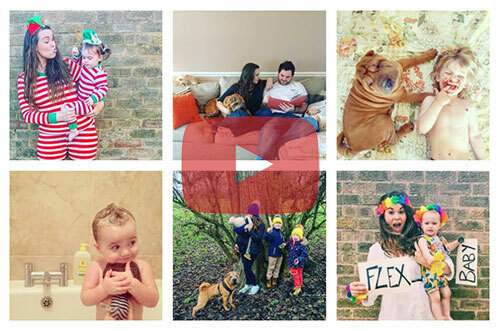 This is the end result! They tasted great and the kids loved them! These are perfect for gift giving, they are just adorable, but if you don’t really bother with giving on Valentine’s Day then these are just a delicious treat to have in the house or surprise family with when they come over! Previous Post Doodlepot artist’s aprons for kids from Not Before Tea.